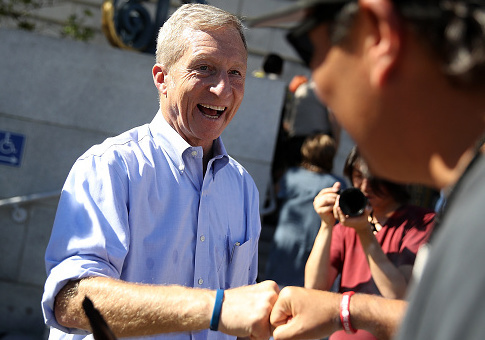 Tom Steyer, the environmentalist billionaire behind an ad campaign calling for the impeachment of President Donald Trump, shot back at House Minority Leader Nancy Pelosi (D., Calif.) after she was reported to have called the campaign a "distraction." Steyer, a constituent of Pelosi's district and prominent Democratic donor, told the San Francisco Chronicle he has "immense respect for Nancy … but she and the whole political establishment in Washington, D.C. are dead wrong about this." Pelosi has been quoted in public as saying, "that’s a great ad," but "privately she was peeved," according to report from Politico on Wednesday. The congresswoman was reported to have said in a recent Democratic leadership meeting that the ad was a "distraction," and the "No Drama Democrats" strategy is key to the party taking back the House in 2018. Steyer has not talked to Pelosi in about two weeks–since just before the impeachment ad dropped–and he didn't warn her about the ad campaign. "I don’t think the deepest fears and needs of American people are a distraction," Steyer told the Chronicle. "I think the American people are looking for something different. They’re looking for someone to represent their deepest values and their deepest fears." Steyer argued it is not too early to talk about impeachment. "This guy is a clear danger to the American people. Do you want to wait until the disaster has happened before you do something?" Steyer asked. "I don’t look at this as something as something between Nancy and me. It is something between Nancy and the American people." This entry was posted in Politics and tagged Nancy Pelosi, Tom Steyer. Bookmark the permalink.